In late February, a dedicated crew of Leadership NZ alumni (and friend Bindy) headed up to Kohewhata Marae to give the landscaped gardens a comprehensive tidy up. Four of us arrived Friday night and enjoyed a powhiri welcome, story-telling, waiata and a great meal. Two other Alumni arrived Saturday morning. Fuelled by a large cooked breakfast, we got stuck in. The mahi focused on the landscaped gardens in front of the Whare Tupuna and the carpark area where visitors are welcomed. The landscaping had become overgrown and full of weeds. The mahi involved weeding out privet, woolly nightshade, kikuyu and other weeds; crown lifting and shaping the native trees; pruning flax and removing dead foliage from trees and palms. 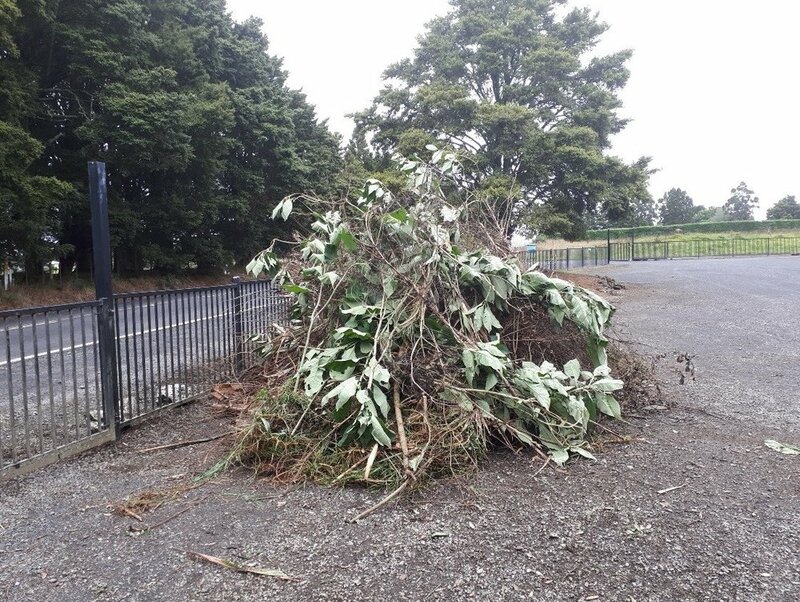 Ted Wihongi (kaumatua) cranked up a chainsaw and we removed unwanted trees and shrubs that were crowding the landscaping. We battled on throughout Saturday with only the occasional light shower that was more a refreshing blessing than a nuisance. The forecasted storm went elsewhere. By day’s end we had restored the landscaped gardens into the beautiful welcoming space that shows off the striking architecture of the Whare Tupuna. A big thank you to the marae folk, particularly Ted Wihongi who welcomed us and organised the work, plus the cooks (Horace, Betty and Bubs) who fed us generously with wholesome delicious food. Also, a big thank you to the alumni that showed up for the working bee. We were a small crew but we got through a truckload of work (literally). It was satisfying to support Kohewhata Marae in this way.